Gracing the news and television programs such as Animal Planet's Fatal Attractions, it would seem as though bad owners of big cats are running rampant. Can a tiger (Panthera tigris) fit into the lifestyle of the average person? Privately owned pet tigers and other big cats (lions, cougars, mountain lions, and leopards) are an obscure reality, yet their true presence is wildly exaggerated by special interest groups and the news media. While many exotic pets have tremendous popularity, big cats, for obvious reasons, are not commonly kept. 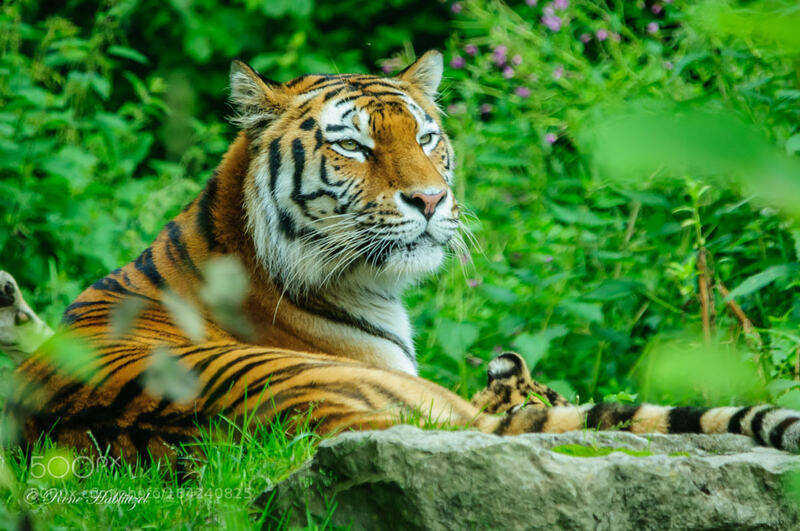 Due to the negligence of a few, the few true owners of ‘pet’ big cats frequently make headlines and bans are prompted of other exotic animals that are of little or no danger to people beyond a cat or dog. 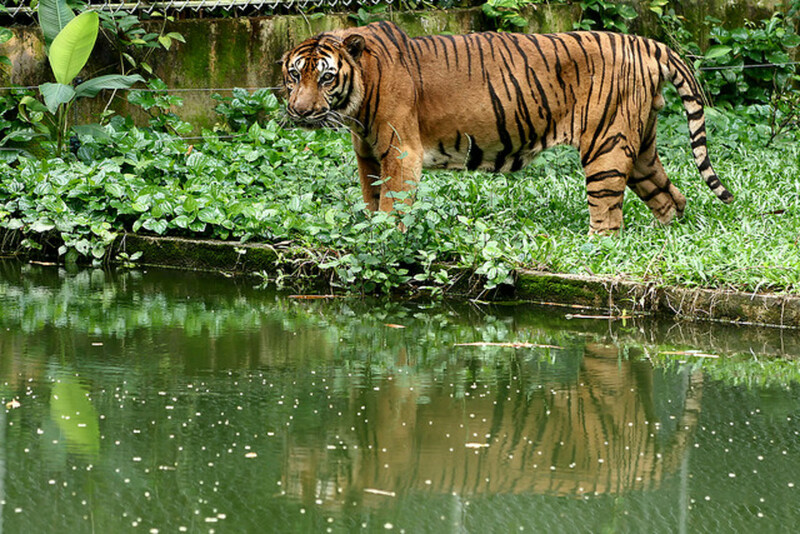 The reason may be that the public views the idea of a ‘backyard tiger’, which is a tiger maintained in a non-professional zoo-like setting, with disdain, but not all so-called backyards (or owners) are equivalent. There are reasonable ways to bring about the proper husbandry of big cats, as long as the owner’s lifestyle fits specific criteria without exception. It’s good to see that so many people are surprised to find out that people privately own such a class of animal, which should put to rest the myth that it is a rapidly expanding industry. Big cats are what should be considered a very high maintenance animal to assume the responsibility for, and their private ownership should only be considered by committed to individuals in special circumstances. Most owners of these animals have dealt with big cats or other exotics in their occupations and businesses (many of these so-called pets are often a part of the owner’s business), or they are usually highly experienced enthusiasts. Caring for such an animal should never be taken lightly, and regulations, not bans, should reflect that. Where can you buy a pet tiger? A quick internet search will yield many results: fake websites that purport to offer a variety of subspecies of this large feline in a user friendly format, websites that strongly discourage the inquiring minds from ownership of this animal, and results on the care of tiger salamanders, an exotic pet that is a somewhat less demanding. Where are the sites that you can easily buy tigers from, such as is asserted by the aforementioned animal rights groups? Websites such as exoticanimalsforsale.net and magazines like Animal Finders Guide ($2.50 per issue or $24.00 for a year subscription), offer a convenient platform for breeders, brokers, and any other person seeking to re-home their animals to list pets for sale. Common animals posted on the site are highly exotic, from coatis, to foxes, to servals, which is a ‘small’ wild cat from the plains of Africa. Yet, ‘big’ cats are rarely offered, and when they are, the sale is only applicable to USDA licensed facilities. If an individual is willing to sell a tiger or any equivalent animal to whoever has the asking price without asking for proper permits and other such qualifications that reveal the potential buyer to be a suitable owner, this person is to be regarded as an unscrupulous breeder or dealer with no interest in the welfare and long-term happiness of the animals they exploit. Big cats for sale may come from animals that were originally bred for their use as cubs, which is another ethically questionable practice. Unfortunately, in top of the line AZA-accredited facilities, ‘surplus animals’ that do not fit into certain breeding programs are often euthanized. It would be a positive relationship, I believe, if such animals could be spared and considered for adoption toward responsible and ethical caretakers, whether they are private owners, so-called sanctuary owners, or anyone else who can offer the care toward the animal. Therefore, zoos that do actually offer these animals toward the population who are not a part of this ‘high and elite’ club of specialized zoos are often ethically questionable with their practices, yet this is one way to obtain the animals. Breeding tigers specifically for the ‘pet trade’ presents many issues, and the main concern I have is the ratio of proper homes toward animals produced. As previously stated, the ‘proper’ home is very rare, and unfortunately, there exists many individuals who take animals that are unscrupulous. Any such animal that has low demand, from domesticated cats to tigers, should not be intentionally bred without consideration of its current and future populations. The most ethical way to obtain a tiger is to 'adopt' an unwanted one from these and many other sources. Getting back to the ‘backyard’ tiger assessment, to responsibly and ethically care for an animal like a tiger, it is clear that one needs to have sufficient space and funds to build the sturdy and specialized caging that meets the needs of the animal, makes the possibility of escape as small as possible, and prevents easy access from intruders into the enclosure, whether they be human or animal. 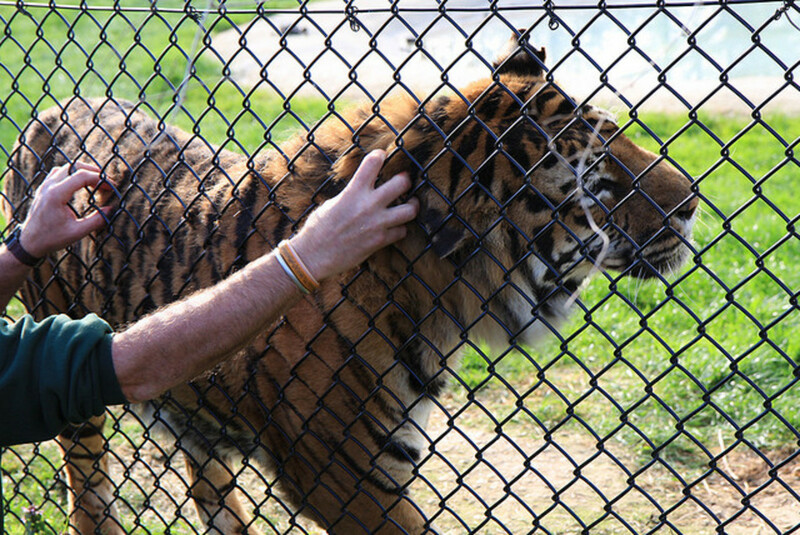 One thing I like to stress about the existence of captive animals that are too large to ‘play’ with their owners (interacting with dangerous carnivores will be addressed later on in this passage); they will have to live over 99% of their lives in their enclosure and it is essential that the enclosure is developed with this in mind. Therefore, this means that a minimum amount of space should be defined, but the standards do not cease there. The captive animal, so to speak, must be able to make something out of their space, and not just view the opposite end of the enclosure to see a continuous, uninteresting box. An animal’s enclosure must be designed to mentally stimulate foraging activity, meaning that there should be varying features in the space, such as trees and other such barriers, and there should be varying levels of elevations, such as makeshift pedestals and hammocks. In fact, an extremely spacious enclosure that is barren is not preferable to a smaller enclosure that incorporates these aspects. Tigers specifically should also have a water source to play in. 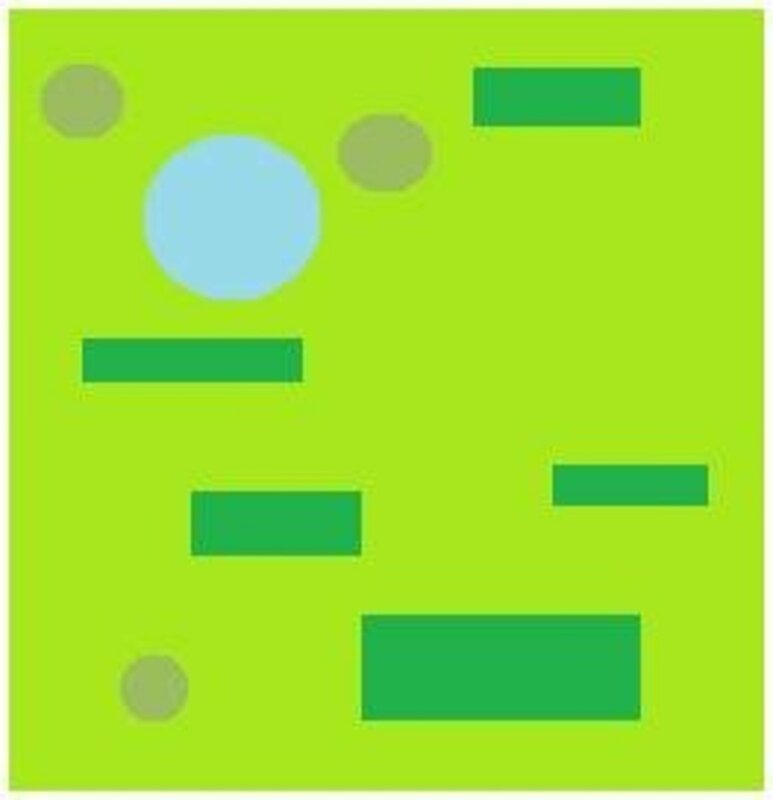 This image represents a possible enclosure arrangement; the shapes represent different-sized barriers with varying elevations and water features, while leaving space for free movement. Tigers may patrol ranges in their native environments of up to 50 to 1,000 square km (19-386 square mi.) but of course, they must do this in order to locate and hunt prey. Unfortunately, regulations that specify minimum enclosure size requirements are inadequate, in the same way that they are for many animals used in agriculture, and both should be amended. The Florida Wildlife Conservation Commission calls for a minimum enclosure size of 10’ x 20’ (200 square feet), which, as a permanent enclosure, is ethically unacceptable. USDA standards typically only require that animals have the ability to stand up and turn around. The proper enclosure type may vary, but a large cat should be able to carry out basic behavioral movements, such as having the ability to run in the enclosure for a few seconds without meeting a wall. Running, jumping/climbing, foraging, and playing are all behaviors that should be encouraged with an enrichment program. The potential hazards of big cat care is the most concerning and important aspect of husbandry to nearby residents and the general public. Although cases of mauling and deaths from escaped pet exotic carnivores toward people who are uninvolved with the care of said animals are incredibly rare and strongly dwarfed by cases of domestic dog attacks, public safety should be carefully and intricately considered in all elements. The local law enforcement and animal control should be aware of the presence of these animals. Caging should be designed to prevent such incidences, and property that maintains large carnivores should be double fenced. Furthermore, a plan should be set in case of any worst case scenarios. Even professional zoos have had run-ins with unexpected escapes. The possibility of such an occurrence can never be fully eliminated, such as dog attacks from any existing breed with teeth cannot be. Non-lethal ways to thwart attacks will be discussed further in this article. Microchipping is another consideration for tracking escaped exotics. Zoonosis and disease is another important concern, which is why caging should prevent outside animals from entering. For instance, rabid foxes or raccoons could easily become prey (or taunters) of captive tigers. Always note any unusual variations in an animal’s behavior. 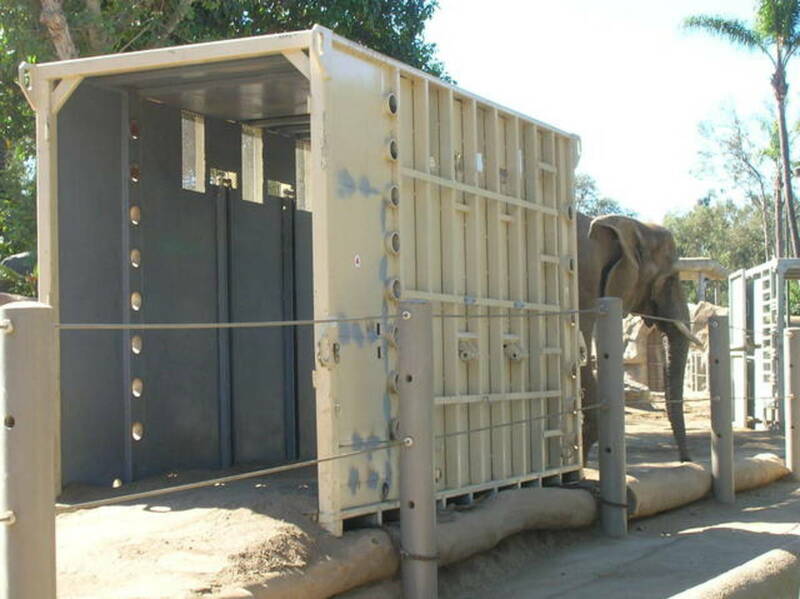 Crate training an elephant at the Los Angeles Zoo. The transport crate is positioned so that the animal must walk through it as part of its daily routine. This is another reason why ‘crate training’ is an important aspect of wild animal husbandry. Unlike dogs, wild animals and even dangerous carnivores are typically uncomfortable in new settings. Crate training involves familiarizing a captive animal to a cage or crate that will be used to confine the animal during extensive cleaning of the main cage, transportation to other locations, or essential vet inspections (vets will need to draw blood and take other samples). Crate training is accomplished by routinely feeding the animal in this location or placing the crate in a location where the animal will consistently walk through it as part of its daily routine. The crate can also be a part of the animal's enclosure that can serve many other purposes. During confinement to this crate, the stress level will be reduced significantly. 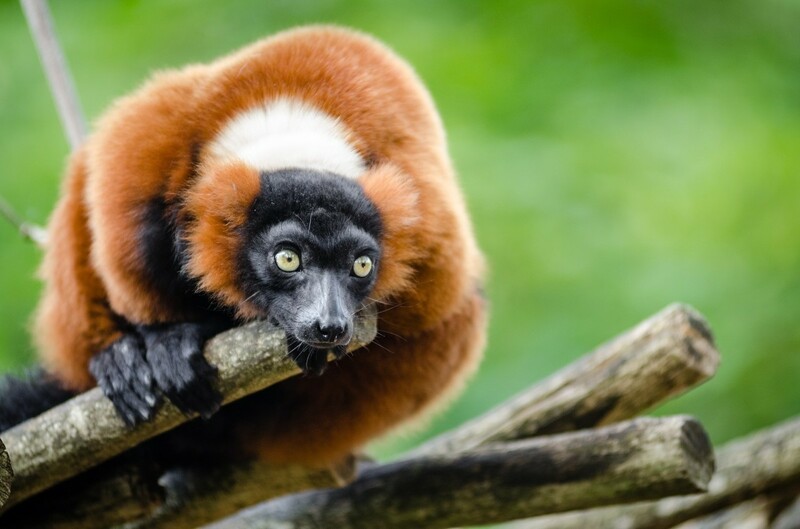 In addition to an environment that is specifically designed with the animal’s mental experience in mind, it is essential that all mammals, whether they are ‘pets’ or ‘zoo animals’, are provided with regular enrichment. Unfortunately, this aspect of animal care is often overlooked with many pet keepers, including those with less controversial pets, and may mean the difference between a content animal and one that is stressed and exhibits what is called ‘stereotypical behavior’ even in a spacious, beautiful enclosure (although such behavior may or may not always be the result of stress). The key to successful enrichment is breaking routine, having an animal work for its food, and giving animals something to look forward to other than eating. Enrichment can be accomplished by introducing and frequently rotating toys that should be indestructible and manipulative such as the popularly utilized 'boomer balls'. A pool of water for tigers is a reasonable requirement in that its play possibilities remain unmatched. Edible and organic 'toys' meant for destruction such as pumpkins, dead trees, watermelons, and boxes filled with meat placed in an awkward location provide stimulating discovery and promote play behaviors when offered in random intervals. If a private owner can establish such enriching and mentally stimulating routines, they will find success in the mental well being of their captive large carnivore that may contend that of some zoo animals. Therefore, anyone seeking to privately own a large cat must have the time and resources to commit to this routine for the remainder of the animal’s life. Several studies support that animals carry out foraging behavior even in the presence of food and having their other essential accommodations met. Psychological wellness should be viewed to be as essential as food and water for higher vertebrates. Tigers and other big cats should eat approximately 20 pounds of meat daily, with a day or two omitted for a fasting period. This obviously does not come cheap, and consideration should be given to meeting all the nutritional requirements of the animal. Whole prey should frequently be offered so the animal can incorporate bones, organs, and other tissue it would consume in the wild into its diet. The composition of muscle meat is vastly different from that of viscera, in that it is low in vitamin A, proper calcium concentrations, fat-soluble vitamins, and manganese. Big cats fed mostly muscle meat with no additional supplementation may suffer from health ailments such as bone disease and vitamin A deficiency. As with even domestic dogs, bones also provide teeth cleaning relief. Prolonged occurrences of dental disease may compromise renal function and lead to liver abscesses or endocarditis. Many dealers, such as Mazuri and Natural Balance, provide commercially prepared and processed carnivore diets with supplemental additives of vitamins and minerals, and the quality of such diets vary. Rotation of meats and other foods given may decrease the chances that adequate nutritive requirements are not being met. It is probably a good idea to avoid physical contact with big cats, and this is especially important for individuals who are less experienced in such handling. The ethics are questionable; while the handler assumes responsibility for the fact that the possibility always exists that something could go wrong, what will happen to that animal if something does? An animal acting out on its instincts may have to be euthanized via gunshot if it is caught assaulting or mauling its keeper. Interacting with big cats is taking a chance, as many people do. There are however some ways to thwart attacks from big cats that do not involve killing the animal. If handling must be done, or if there is an incident such as an escape or mauling through the enclosure, pepper spray is essential for responsible owners to have on site and on hand during close encounters. Other useful items to have are fire extinguishers, an air horn, and even a hose. Fire arms are effective but dangerous (as well as deadly for your pet) and should be used as a last resort. Instead of entering the enclosure, operant conditioning (positive reinforcement and food rewards) techniques can be used to carry out inspections for health issues and taking veterinary samples, feeding, enrichment, and to make transportation stress-free. If any of the criteria outlined in this article sounds unreasonable or cannot be accomplished, you probably don't have much business truly considering big cat ownership. There are many less demanding exotics, including cat and cat-like animals that are not easily capable of causing adult human death if the urge so inclines them. These animals still require a committed caretaker for life and it is a life decision that shouldn't be taken lightly in any sense. However, the few people who are able to meet the demands of such animals should not be barred from having the option to choose this life style. If a pet of any species is content, healthy, and well cared for in a safe setting, what gives another person the right to say they shouldn't be caring for it? If you are interested in keeping exotic animals, including non-domesticated felines, this book can be very helpful. While it is directed at zoo professionals and some of the material can be pretty dry, it is loaded with information, research, and references. A must read! Have you ever desired to own an advanced exotic animal after viewing one in an educational presentation? Do you own a pet tiger and if you do, is it easy to take care of? No, I don't own a tiger, but I can assure you that it isn't easy unless you have enough money for the maintenance. i want to raise real tigers to keep them from diappearing thank you. wanna know how to hug a tiger? answer- very quickly! wanna know what to do after you hug a tiger? answer- run faster than he does! wanna know where to go after hugging a tiger? answer- somewhere safe! wanna know what I do after I get to a safe place? answer- say thank you lord I'm still alive! Your credibility has therefore been shot. Unfortunately it is not uncommon for me to see my critics making unforgivable errors. 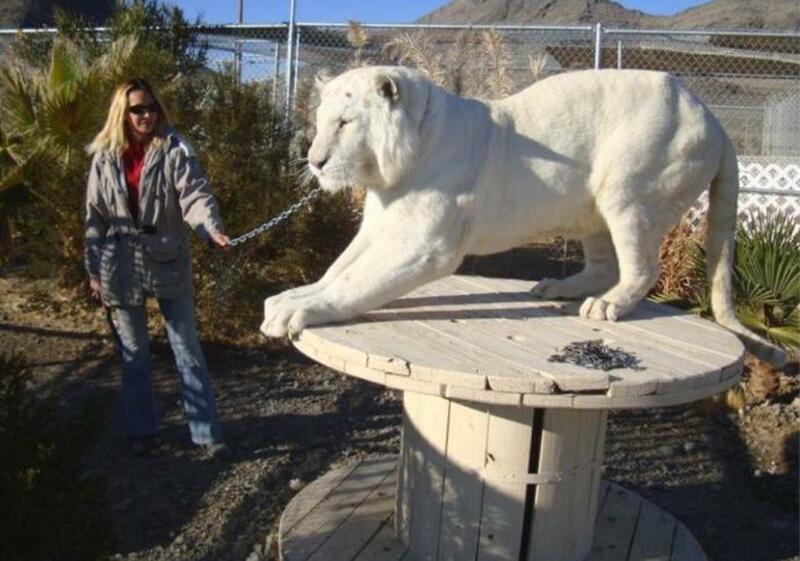 THAT IS NOT A "WHITE TIGER" THAT IS A NEUTERED MALE ALBINO LION. White tigers, additionally, are man made inbred pheno and genotype of tiger and should NEVER be considered an exotic or pet species or differentiated in any way from the Siberian or Malaysian, etc., tiger of which the "white" tiger is a genetic mutation. Most albino tigers do not come from healthy breeding practices in human care and sadly KEEP being bred for the purpose of entertainment and exotic pet ownership. The same is true for albino lions as with albino ("white") tigers, however for the purpose of desired appearance, albino lions are hardly bred as aggressively as albino tigers. Some may argue that neutering big cats as pets may also be unethical. Thankfully the albino lion ( the misrepresented well kept "white tiger") was neutered to prevent unauthorized breeding and exotic pet trade. I wish people would think the same regarding ethics, think with common and educated sense, and say yes to neutering these albino, human bred specimines for the greater good of the endangered natural geno and phenotype species. Sadly I see many people mentioned in this article simply banning neutering of all animals because it's "unethical" to dare alter a wild animal. Uninformed/uneducated owners with big mouths will shout "murderer" before "I was wrong". End up doing a lot of harm to many animals and people by doing what THEY think is the right thing. (Not to point fingers [REMARK INTENDED] but an "experienced" "wildlife" "handler" 18 year old Sky who claims keeping an intentionally human bred liger as a pet qualifies onesself to defend and accuse various actual and licensed wildlife caretakers, who I daresay have spent over 18 years merely STUDYING the species they now manage... Yes those people are to whom I refer.) Every day I'm thankful to work for animal welfare rather than humans'. Author if you could update the albino lion photo and either remove or rename it, I'm sure that in some way doing so will positively affect the wild lions and remaining tigers we seek to protect. Thank you. hello,i am planning on buying either a black leopard cub or a jaguar cub but i want your opinion,which would be better. i live in pakistan by the way. Melanie if you're serious I suggest you contact Zuzana Kukol with Rexano, this article is just here to educate the general public. I found this to be very helpful. I do have a USDA license, I currently only have primates but am in the beginning stages of building a zoo by AZA standards. I plan on getting tigers but am doing more research on them. I am going to have 3 acres for them fenced in with water, trees rocks den ext.. how many tigers do you think would do well together in that size? I was only planning on getting 4 tigers. Also is it better to have only 1 male and rest female to limit problems between males? Our indoor enclosure will also have water, concrete/sand floor. What would you suggest for ground cover indoors? Sam-- There's no difference MORALLY is what I meant with that. Keeping a tiger is not like keeping a slave, as one person suggested. The media criticism is not justified by a long shot. They most try to tell people that big cats are on the loose, killing children. Far from the truth. If tigers need room give them room. Why is it so unrealistic that a private person can own a few acres of land for them? 2 measly acres is still larger than what even many AZA zoos have. "There is no difference between owning a big cat and a cat." Then someone explains the differences and you say: "I obviously knew that." So which is it, no difference or you acknowledge the difference? I don't disagree with your outline of how to care for a big cat, but I also see many owners falling horribly short. Therefore, the media criticism is completely justified and with the USDA regulations being pretty sad, I think calls for better regulation is necessary. I've owned exotic pets and I can understand smaller ones, snakes, reptiles etc. But big cats naturally need so much room, I just don't see how one can be ethically kept (endangered breeding programs aside). Plus most tiger owners seem to raise them up as cubs, not adopt unwanted tigers. Furthermore, cats are naturally fickle and unpredictable - if my cat were large, I'd definitely have a hospital bill. PS. "Forging" is mentioned a few times in the article. The right term is "foraging" (with an "a"). Lynxs are still a challenge, good luck! I've always loved big cats, but I don't think I'm going to be in a position to keep one any time soon. I think one day I may be able to get myself a 'medium' cat like a Lynx though. Melissa A Smith: Thank you for writing such a responsible and informative hub :) Very nice work. Have a great week. tlmcgaa70, I obviously knew that. actually, there is quite a big difference. big cats require a lot more room and food than a comparativly smaller house cat. big cats like little ones, will play as if playing with their own kind...neither realizing how much stronger they are then we or how much more fragile we are compared to them. with small house cats we get by with bites and scratches, with a big cat you would get far more damage. and then you have differences in species...if you raise a lion or lioness, you must take into consideration that these are social animals used to pride life, similar to that of a wolf pack, and you have the alpha and omega set up. this means you will have to show your alpha status to a large cat where you don't a house cat...likewise you would be making a mistake if you try to raise more than one large cat that was solitary in nature, in close quarters. i honetly believe it can be dangerous to think there is no difference between house cats and wild cats. There is no difference between owning a big cat and a cat. Honestly, nobody has the right to own wild animals. It's like asking to own another person. It doesn't matter that you want an exotic animal because it would be fun or cool, stop being selfish and think about the animal and how it deserves to be in its own natural habitat. Instead of promoting the buying of tigers and other animals, why don't you promote the donation towards helping these animals survive in their natural habitats against selfish and greedy humans. Humans need to learn to put others needs before theirs. Frankly, some of the images did scare me. Personally, I think it's quite risky to keep these animals as pets. At times, it can be life threatening as well. Hi again Jones, the information in this article has been collected from exotic pet owners and zoo literature that I own. It has been viewed and approved by some real life tiger owners. The main objective of this article is to show people how tiger ownership can be accomplished privately. Most people are shocked to hear that tigers are kept as 'pets'. They picture a person keeping it in their living room or walking it down the street threatening public safety. I think I've successfully shown that this doesn't have to be the case, that an individual can be successful with tiger care just like a zoo can. How many of you idiots that think this is a great article have taken on board that the author not only has never owned a tiger in her life, she's never owned a domestic cat! In fact, I can tell you that she's never even picked a cat up, as she admitted it on another forum. She's a fantasist, just like you all are. Keeping a tiger in your backyard indeed - who the hell do you think you are, Emperor Nero or something? 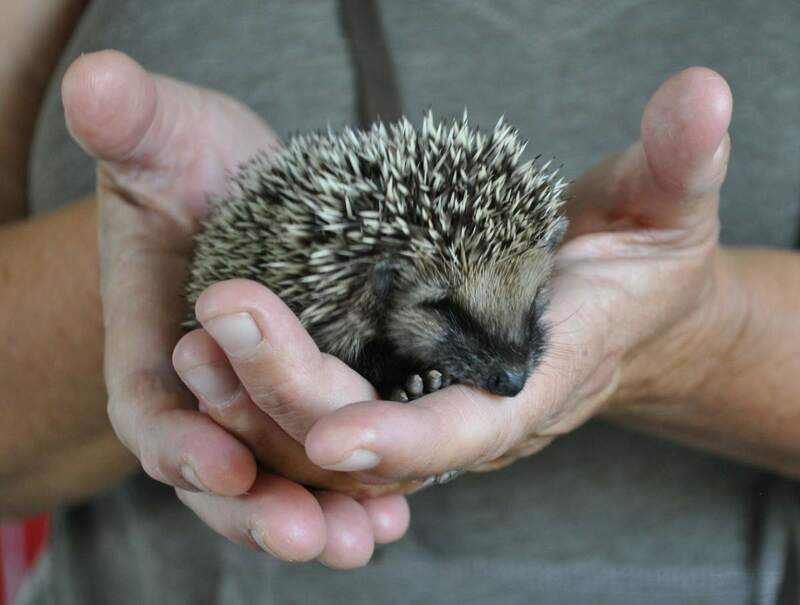 Most exotic pet owners have mental health problems, and this woman is no exception. Nor are the rest of you by the sound of it. Fantastic article. I just wrote a hub about a beautiful lion habitat in town called A Sense of Pride-Lion Habitat Ranch. The owners are wonderful and of course, so are the lions. I wouldn't consider owning an exotic animal simply because I don't have the necessary experience and not just anyone should own these. It is a big responsibility. Thanks for the info! Voted up! Unfortunately that is an issue Larry, because there are so many laws that prohibit non-accredited facilities and private owners from just causally taking in animals like these. Many states prohibit re-homing of these animals across state lines. It's likely that an animal 'rescue' or 'sanctuary' will take them in, or if allowed, one of the 'smaller zoos'. AZA-accredited zoos probably will not take them. So what happens to the tiger when the responsible owner passes away or can no longer physically care for it? Thanks MJennifer, it was my hope that this hub would discourage unsuitable tiger owners without yelling that no one on Earth is capable of doing it, which is untrue. To care for one requires considerable expense and intelligence, and these animals tend to fall into the wrong hands because of their massive appeal. I think domestication is not really of importance here, tigers as just large, powerful animals that are meant to eat animals that exceed humans in size. If they were smaller, they'd be appealing pets in my opinion, aside from their scent marking. Although they aren't as easy as shih tzus. I must admit I was initially skeptical as I clicked on this hub, Melissa! What a great surprise to find such a responsible and ethical approach as you've provided. It is the owners who fail to recognize the very wildness of their wild pets that end up being irresponsible and, as we know, it is usually the animal that pays the ultimate price. Exotic animals aren't domestic. To anthropomorphize them, or to let ego override their "wild" nature, is to beg for catastrophe -- and it denies them the very special nature we love. You've done a good job on this article in promoting responsible ownership. Thank you for your thoughts. You volunteer at a facility that specializes in taking in animals from owners who do not want them, therefore it is inevitable that you will be at the front lines of witnessing the influx of poor caretakers. These situations are just a fact of life and also apply to children. There will literally be no animal group that cannot end up in the care of a person who shouldn't have it. I believe my article dispenses decent information on tiger care, if someone chooses to read my article, buy a tiger, but ignore the advice in the article, it's unlikely that such a person wouldn't make bad decisions without my contribution. There are resources out there, and I have no control over how people use them. 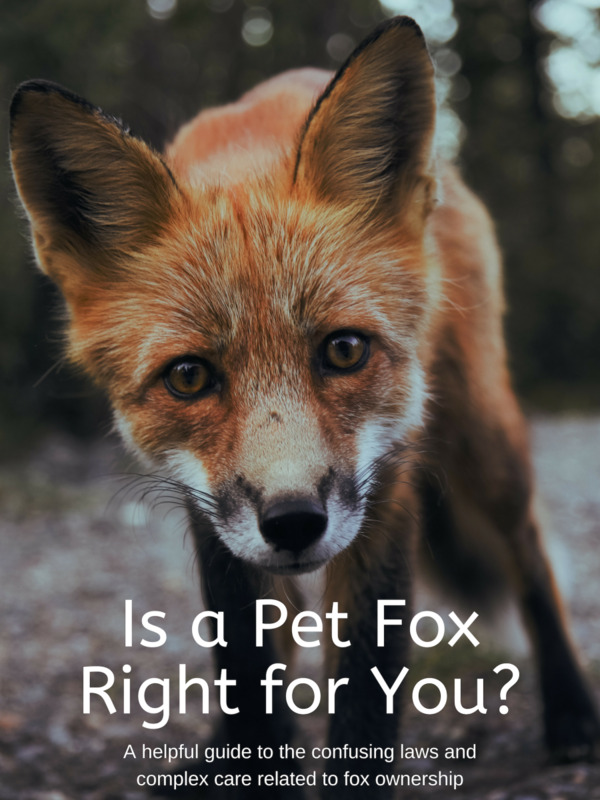 For every 'pro' exotic pet article that exists, there are about 500 that are 'anti', so if people are determined to make their own decisions, that is their own will. With that being said, impulse buys of tigers are not only rare, but nearly impossible. It is not likely that you will be able to locate a source offering a pet tiger to a non-USDA facility. Keeping such animals requires a massive overhaul on one's lifestyle. Such keepers surround their daily lives with preparations both financial and educational to accommodate animals like these. Dismantling the exotic pet trade in the United States will have no effect on what happens outside of this country. So-called pet tigers are not shipped here from overseas, and it takes basic common sense to buy from reputable bird breeders. Of course, this article is not about birds, and what happens with birds is irrelevant. Bird dealers do not also deal with pet tigers; it is not one giant entity of animal smugglers. Tigers reproduce readily in captivity. There are unfortunate circumstances of animals being shipped in huge numbers and being kept in inhumane conditions, not unlike what happens with domesticated pets such as dogs, cats, and ferrets. It is an animal problem, not an exotic problem. I saw this hub, and read it with dismay. While you are obviously a responsible pet owner, I have seen far too many people who aren't. I volunteer with a dog shelter, and see so many mismatches, abandonments and abuse that I don't even trust about a quarter of pet owners anymore to own a pet as normal as a dog. 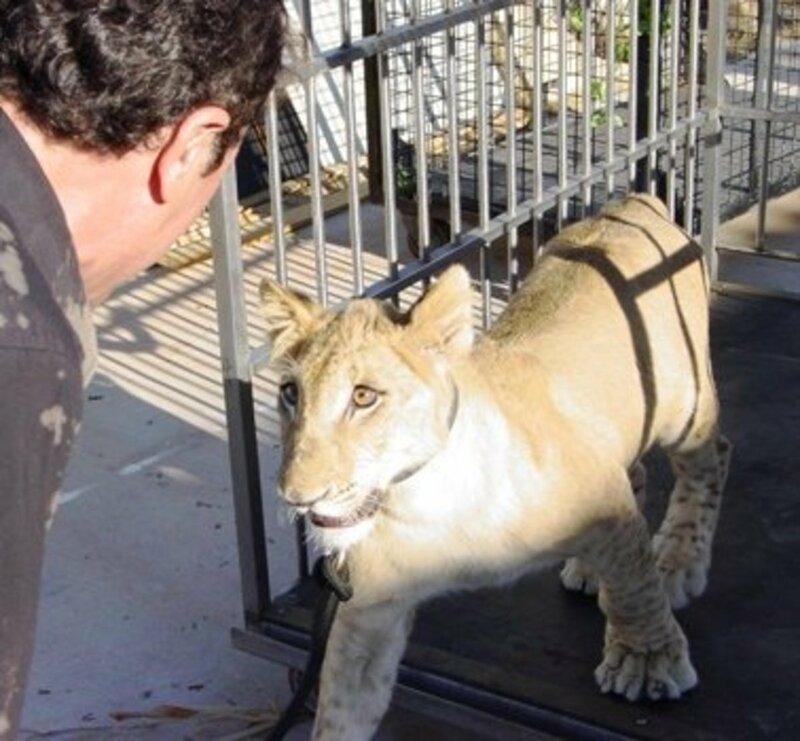 With the extra demands and wild instincts of an exotic pet, why open this door and allow some idiot to enjoy the fantasy - or, worse yet, act on it because of your hub - and subject another poor exotic animal to untold misery? There is already a massive black market trade around the world in exotic animals meant for pet owners, and it needs to be stopped, not encouraged. The mothers of these captured animals and birds are killed, or in the case of birds, both parents can be killed. Then these animals are packed tightly in horrible conditions to get past the customs, and certain percentages of them are expected to die from these conditions. I am very much against the exotic pet trade in any form. And I don't believe that most people are prepared to own wild cats of any size. Very interesting and useful information. :). I can't a pet Tiger. I completely agree with you Jmillis, thank you. I enjoyed this hub, Exotic pets tend to get a bad rap when people that do not have the experience or knowledge to care for such animals obtain them and then get themselves of someone else injured. No one should get any type of pet with out first knowing how to properly care for it, even dogs can be dangerous when not cared for properly. I'm glad to hear that tlmcgaa70, thanks! I think I knew what you're talking about, I think those were sea turtles. I also think I should point out that many animals are probably happier in captivity, depending on the species and level of care. great hub. i don't have a problem with private owners of exotic pets, so long as they are responsible and the animal in question is happy and healthy. Pamela...zoos have their place and purpose, more with each passing day. sometimes animals no longer have a safe habitat, and without zoos they would become extinct. no, the animals are not as happy as if they were free...but they are alive and unharmed. some time ago i read that a certain turtle was considered to be a delicacy to the Chinese, and it was being caught and shipped over by the thousands. the turtle would soon be extinct. one man decided to begin breeding these turtles on a farm, and selling them to the Chinese. many people were outraged at this, they never realized that what the man was doing was protecting the wild turtles and allowing them to multiply again. the Chinese weren't going to stop eating the turtle until it no longer existed, so what he did was provide what they wanted without depleting the wild specimens. caging animals is sometimes the only way to keep them from going extinct. Not kidding at all, the people in the photos all own big cats, and it is a hot button issue these days which unfortunately bring criticism toward all pet owners. Yet, experience and money could yield a good big cat owner, they simply are large (albeit a little wilder) housecats. I wasn't aware that there was another hub on this subject, maybe it was mine and I changed the picture? Anyway, thanks for commenting. I'm honestly surprised by your position, it's not often that I come across someone who is against zoos but open-minded about exotic pet ownership. I'm not sure why you are distrustful of all zoos, as they vary just like pet owners do. But I'm glad you are OK with pet keeping. They shouldn't however be released into the wild, many animals must receive survival skills and non-human interaction at a specific early age. Bobcats in particular can adapt to the home life and do very well with the right owner. Thanks for commenting. "How to Care for a Pet Tiger" Really? Are you kidding? Another how to care for a pet tiger hub? Like you can't come up something out of the ordinary to write about? Awesome hpage and professionally done! When I was a little girl, my aunt and her family in British Columbia had a baby Bobcat for many months, but finally let it go. Hopefully, it wasn't domesticated to the point of not being able to fend for itself. I've very against the keeping of animals in zoos. I've never thought about the idea of having an exotic animal myself. To rescue one and to make sure it doesn't get put in a bad place or get euthanized, I suppose, would be a reason someone might ethically think about doing this if they had the resources. This was a very well thought-out hub. Wow! I really enjoyed it. Voting up, interesting and sharing. Hi lizzardlover, if one isn't planning on keeping an animal as it matures into the animal it was meant to be it can't really be considered to be one's 'pet'. Sounds more like a foster home. 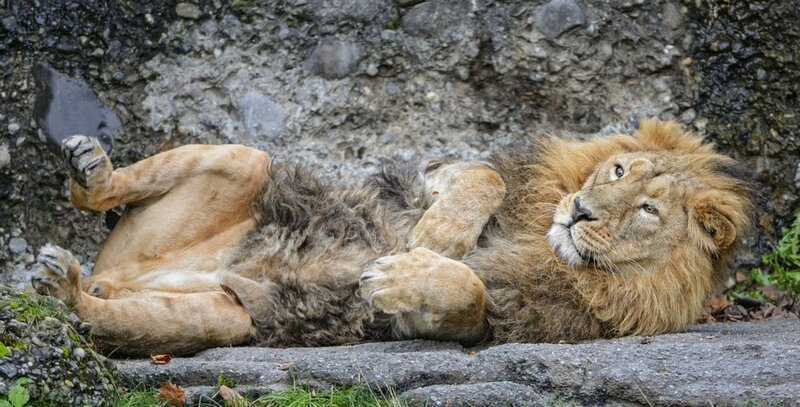 This article outlines the criteria for keeping adult big cats. Some people do go in with their cats and hopefully they realize it is a risk. It's not like the animal wants to harm you and they do have bonds with the people who raised them, but even during play an animal can get overly rambunctious and not realize its own strength. Human-reared carnivores usually make terrible wild release candidates, especially without extensive rehabilitation. I don't think anyone has ever been -eaten- by captive big cats; these so-called attacks are almost never for food, which is often mistakenly believed. I think only cubs and baby wild animals should be pets. but as they get older there natural instincts kick in and they will kill you. I have seen it a million times, the owner trusts there animal so much that they are dumb enough to go in the cage with the fully grown big cat and think they will get a great big welcome from this animal and the next thing you know you are being eaten by it. so they really should be let into the wild as they mature. and not be pets there whole life. Hi Oscarlites. I believe bobcats and mountain lions (pumas) are native to Alabama. lots of good information.. I wonder if we could get some of these animals introduced into the woodlands of south alabama? we have all of these wild alligators already.. why not some cats? lots of woodland here. lots of small prey for them to feast on.. actually hmm well better keep them safe somewhere.. too many hunters! But I do love seeing animals free and wild.. I'm pretty sure I saw puma here once driving through a state park at night. Well James Cox, there are smaller exotic cats like bobcats, servals, and caracals. Bobcats are the 'easiest', and I've just written a hub about that. All of these animals require an immense lifelong commitment. I don't think you will find snow leopards anywhere. Best place would be zoo surplus if that ever happened and if they were unscrupulous enough to sell to private individuals. Leopard species are known to be the most dangerous big cats. 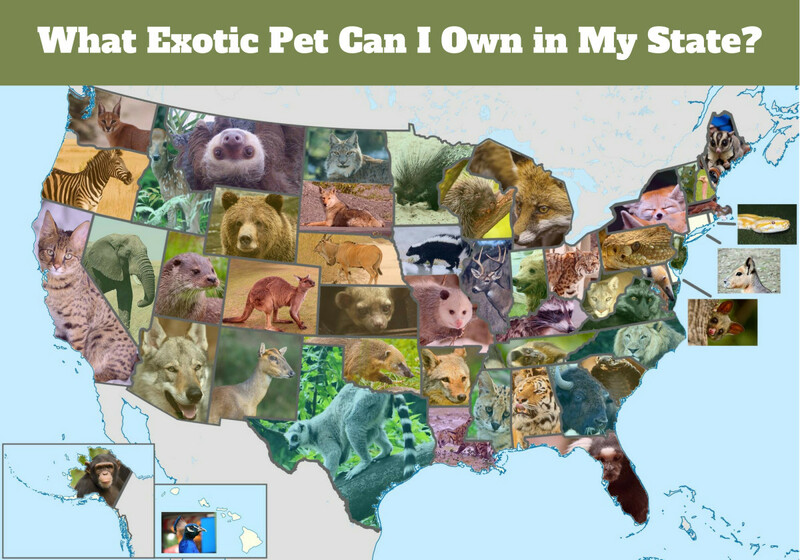 I do believe that most states require permits; you seem to be in Florida so I think that's a 'class 1 permit' for tigers/leopards and class 2 for smaller exotic cats. Not sure if bobcats are illegal considering that they are native. So again, if bobcats aren't going to work I'd recommend a serval, as they are readily available and do not kill, but remember that they should have outdoor housing and may be destructive indoors. Savannah cats are hybrids that are a nice alternative to the full blood wild cat, having more reasonable care, although high contents are very expensive. Although caring for any exotic cat will inevitably entail exuberant expense due to house modifications, caging, vet care, ect. Keep this all in mind when considering these as pets. Good luck and thanks for the comment. My wife wants a tiger, I would love to get one but would rather have one a little smaller that I wouldn't have to worry about as much. I have looked at the snow leopards as an alternative but don't know if I can get one or how much it would cost. I emailed a few places I found on the internet but got no response. I have owned a few exotic pets like an 18 foot Burmese python and a marmoset monkey. I want a big cat too but not as big as a full grown tiger. I would like to have one that we could play with in the house but weighs around 40 to 100 pounds. 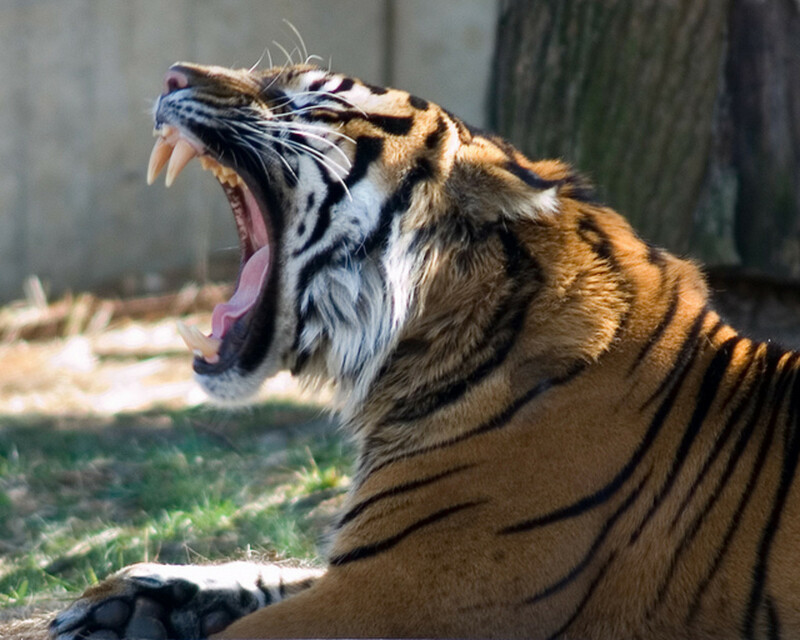 I like the sound that tigers make and what ever I get I want it to be able to have that growl or roar like a big cat. Very nice hub!!! Glad I found it. Amanda492, my question was rhetorical. The 'answer' to my question is that no one should have the right to take away rights from people who don't deserve to have their rights taken away. First off, thanks for your comment. The fact that you've cited BCR as though I've never heard or them and their claims suggests to me that you may be a novice at this topic and controversy. I've examined their collection of websites thoroughly. I am very well-seasoned in all of their rhetoric and claims about exotic pets. I don't find them to be a very trust-worthy source on this topic. They are agenda-driven and I've caught 'them' in too many lies and misrepresentations. Please see some of my other hubs that address them, including 'facts you should know about big cat rescue', and 'exotic pet epidemic? take the Google alerts challenge'. "The private ownership of big cats is doing nothing to help the species"
The only thing that matters to me is that it isn't doing anything to harm the species. If you would like any more information with your research or for me to point you to more sources I'd be happy to. I've been researching this topic for a university environmental project and I came across your blog. "However, the few people who are able to meet the demands of such animals should not be barred from having the option to choose this life style. If a pet of any species is content, healthy, and well cared for in a safe setting, what gives another person the right to say they shouldn't be caring for it?" I feel the support of private ownership of tigers is a bit of a mistake. To own a tiger in the U.S. you must have a USDA approved license. 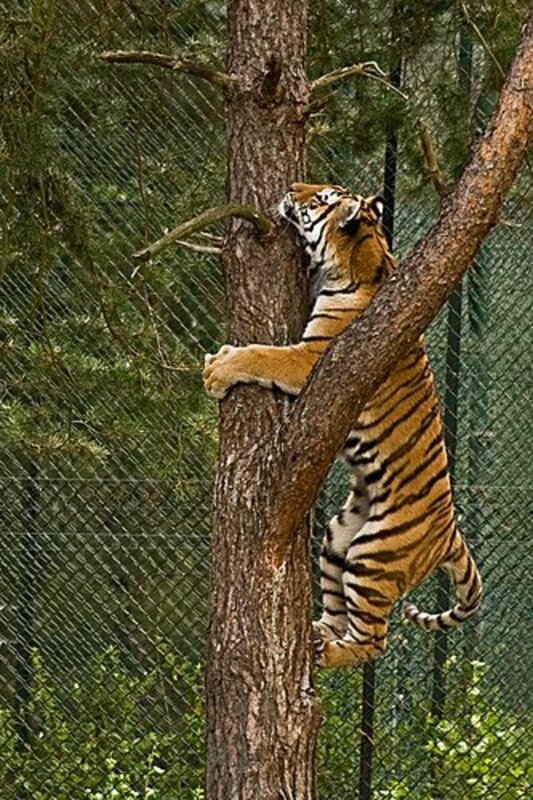 Yes many of the 'terms' you have outlined for the owership of tigers and big cats are outlined in the license but it is niave and uneducated people who abuse it. "According to a 2010 audit of USDA by OIG, 70% of private owners with four or less cats were actually pet owners simply using USDA registration to evade the state law. So, individuals buy cute cubs that grow up to be dangerous, unmanageable and expensive to feed. They end up in tiny, barren cages in back yards, abandoned to sanctuaries that are struggling financially to support the steady flow of unwanted cats, or in the illegal trade for their parts. Cats owned by exhibitors do fall under the regulations promulgated by USDA under the Animal Welfare Act (AWA), but they fare no better. The USDA sets minimum standards that allow these cats to spend their entire lives in small, concrete and chain link cages that in effect are prison cells. And even these minimal standards are totally impractical to enforce. USDA has about 100 inspectors to police over 2700 exotic animal exhibitors and thousands of other animal facilities. Horrible facilities are cited year after year and only a few of the very worst are ever shut down. As a result, the vast majority of big cats live in conditions that any compassionate person would view as cruel and inhumane." The private ownership of big cats is doing nothing to help the species and no matter the few acceptions of 'responsible' owners there is too much exploitation occurring for it to be acceptable. Haha, no way. Tiger owners are pretty uncommon, I'd certainly post many more pics and write more about it if I did. 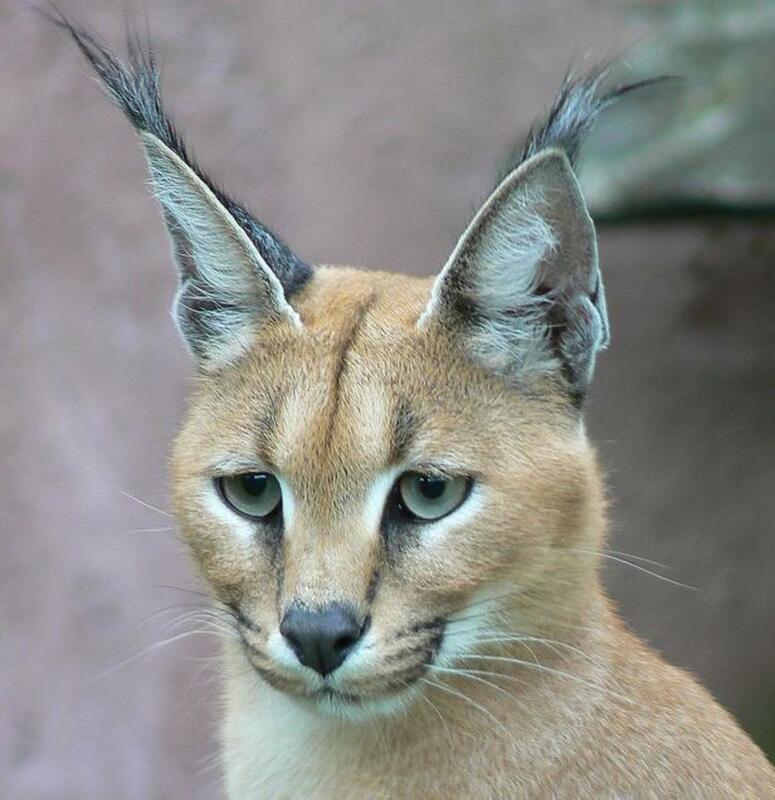 The biggest cat I would like to someday own is a caracal. I'm just not into the big, bulky, potential fatal types. Thanks for commenting! Thank you for commenting Chris Hugh. What a person "deserves" is an arbitrary concept. I'm focused on a reasonable existence for any animal in captivity whether they are used as a pet, food, or zoo specimen regardless of species. Interesting Hub, lot of information. You make it clear that owning a wild animal is a big undertaking, expensive and only for a dedicated few. You also focus on the needs of the animal being more important than the ego if the would be owner. It's kinda a fun thing to think about having an exotic, but I think domestic kitties are already more wondrous and exquisite than any human deserves. Australia has very strict laws, so no they aren't legal there. I wouldn't own any animal without being able to meet its needs. I think it's possible with big cats. There are a few animals I believe that no one should really own. I just adore these 'big cats' but as pets I don't think it is a good idea, although I'd love to have one. But we must think of animal welfsre, I don' think they are allowed here, in Australia. @graceomalley Yes...parrots..they require different needs for care than tigers I would imagine. I agree with what you've said. A parrot trained to poop on command I would need to see to believe. Just my two cents - I know that small parrots like cockatiels seem 'ordinary' because they are readily available, but parrots of any size are a continual source of interest to their people. They are highly intelligent, social, and thrive on stimulation. They are very trainable. If you set up your home with some thought (I wrote a hub about sharing your indoor space with birds) you can enjoy lots of interaction, or just being together. My neighbor has a parrot he has trained to poop on command, and this is a great hit with the kids. Thank you for commenting Marla. You are right, it is very important to out the people in this and any other animal-related trade who do not abide by the proper ethics. Thanks for posting, this is a good well researched hub. Offering information on unscrupulous internet sites is always helpful. Hello Entourage, really glad you enjoyed the hub. Unfortunately, there is a thriving anti-exotic pet sentiment. Animals such as tigers and monkeys aren't legal in many states and especially California (viewing your profile) without a permit that is only issued to businesses or sanctuaries (the criteria varies). They are not legal where I live either (New York) and bans keep coming up because of ignorance and the Zanesville incident. This is why it's important to let legislators know that you will not tolerate the disrespect that pet owners are given. Organizations such as Big Cat Rescue and the HSUS do their best to keep the bans going. If you plan on moving in the future and exotic pet ownership is your true interest, remember that monkeys are highly social and intelligent. They are probably best kept in groups. Their care can be very involving and measures need to be taken to keep you and them free of disease. Thank you for commenting. Pet Tiger and care...!! At a first glance the topic heading is dangerous to me.Joking! It is a nice topic. You have explained it well. There are many reasonable things in it to bookmark this hub. Thanks a lot for sharing it with us. very interesting hub...thank you Melissa.